Cass Business School is in the heart of the City, surrounded by iconic buildings like the Gherkin. Actuarial Science student, Sid, explains why studying in the heart of the City provides a great student experience and numerous opportunities. Studying in London was one of my biggest dreams and a Cass scholarship turned that into reality. Cass Business School is in the heart of the financial hub and has a great campus which is always buzzing. It is diverse and dynamic. This campus has the best companies and opportunities. London is your campus at Cass. I am currently on a placement year at Traveler’s Insurance where I have the opportunity be part of Actuarial Work. As an actuarial intern, I am directly involved in actuarial projects and I can see how my university knowledge is being put into practice. Although I am based in Redhill, my company has two offices in London. One is opposite one of the most iconic buildings in London - the Gherkin. I have worked in that office a few times and it is great to be in the heart of London. The Gherkin is home to several companies and being a Cass student gives us a proud qualification that makes us stand out in the financial world. 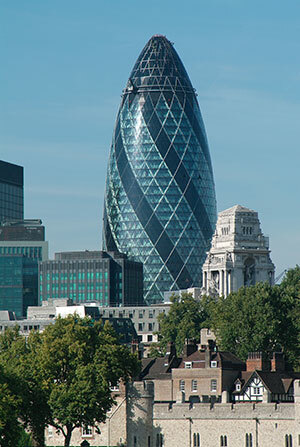 Swiss Re, a leading Global Reinsurer, was previously the only owner of the Gherkin and offers great opportunities for students with actuarial knowledge or any risk background. Standard Life is also an insurance company based in the Gherkin requiring actuarial talent and financial knowledge. This building, which offers an all-round aerial panorama, also occupies a specialist financing company, Falcon Group. Cass students, being in the financial hub, have quick access to these companies. Many of the academic staff have worked in the industry and students can benefit a lot from their expertise. This unique combination of world-class education, professional contacts and central location gives students a head start in the financial world. A five minute walk from the Gherkin brings you Lloyds of London, a futuristic looking building which is a Global Specialist Insurance market and is surrounded by other insurance industry leaders. During my second year, we had a tour of the Lloyds of London building in our Actuarial Practicality module. It was a spectacular building and we saw the large loss register still used today to make hand written detailed records of large ship losses. At the heart of the building is a large busy underwriting room. I have already spent three years at Cass and I still have so much of London unseen. Trafalgar Square, Leicester Square, Convent Garden and other famous London spots are just 20 minutes away. Spectacular buildings like St Pauls Cathedral and Westminster Abbey are just a bus journey away whenever you need a quick moment of inspiration. Museums like Ripleys in Leicester square and the National Science museums are a tube journey away for inquisitive ones. The student life at Cass is always dynamic. London has a huge cultural mix and this adds to the novelty around. A variety of different restaurants can be found all over, satisfying any taste. Markets like Brick Lane market, Old Spitalfields market and Borough market have great street food that can be rewarding after a long day of shopping. For special days, restaurants around London can offer unique dining experiences. There is always something in London to keep your life exciting. As someone rightly said “The day you get bored of London, you have stopped Living”. Cass is a great place to get a world class education, a diverse student life and bespoke professional insight. I hope to meet you here in September!